I Found Myself Alone is one of Swedish born, Berlin based Nathalie Djurberg and Hans Berg’s most iconic works, utilizing the technique of clay animation (“claymation”). 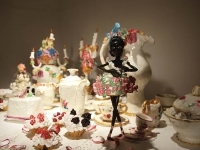 In this video, a young black ballerina in a frilly tutu dances on a decadent tea table with giant fluffy white desserts and elaborate porcelain candles, tea sets and serving dishes. 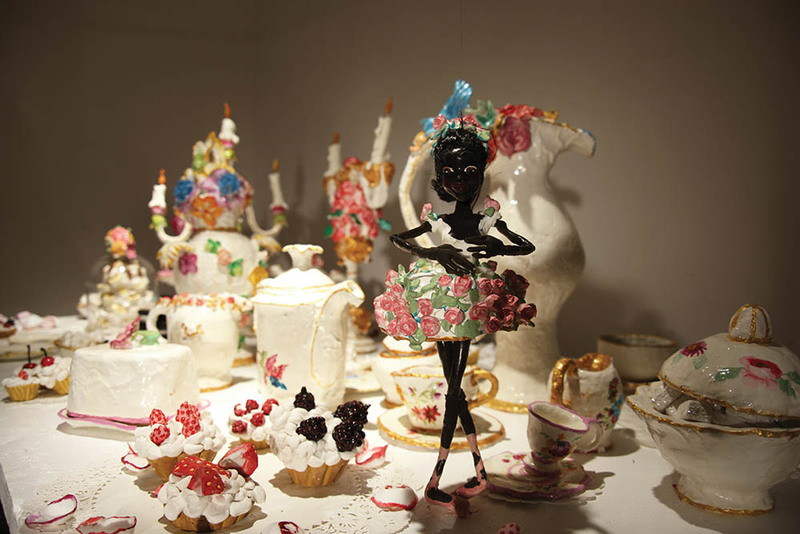 While this ebony-colored dancer seems to be twirling in a fairytale, she soon realizes that she is the only non-white figure in the scene and she decides to paint the candles and desserts brown using chocolate syrup in order to better fit in with her surroundings. Before the ballerina can take in the new scene she created, a candle falls and covers her in white wax, absorbing her into the scene of white sweetness. This work is a dark commentary on racial divides, and the music by Hans Berg leads the viewer through this sad tale. Nathalie Djurberg was born in Lysekil, Sweden, in 1978 and while she studied fine art, she taught herself how to make films and created a distinct stop-motion animation style using clay. She first sculpts figures out of the clay and then makes the still figures move with her animation techniques, blurring the lines between sculpture and cinema. 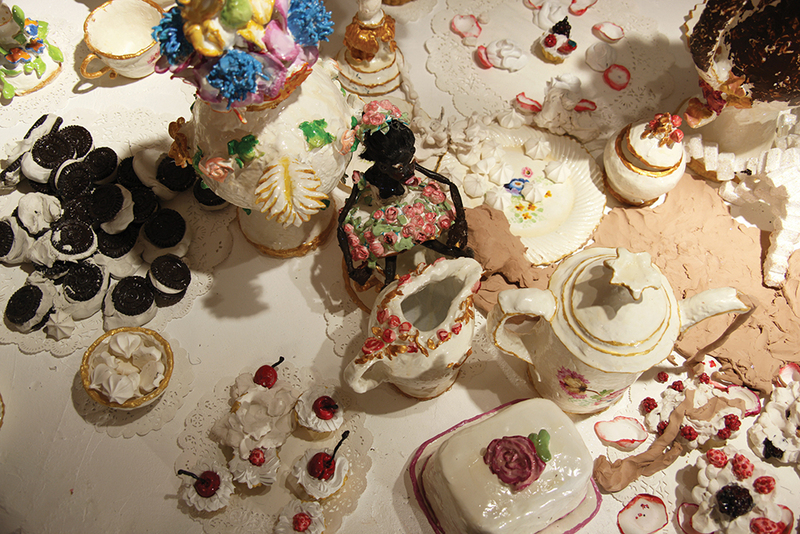 The narratives in her work explore primal emotions and human behaviors and social prejudices. She works with her partner Hans Berg, also born in 1978, who is a techno and house music producer. The two met in Berlin in 2004, and since then he has created the music for all of her films and installations. 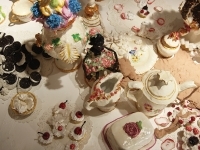 The artists have exhibited all over the world in important museums, and they won the prestigious Silver Lion for a Promising Young Artist at the Venice Biennale.